・ The Reverse Auction will be held on April 06 (Saturday) at 20:00 JST. ・ Also, the Event GMs will be interacting with players in Rocco Town, Channel 10. 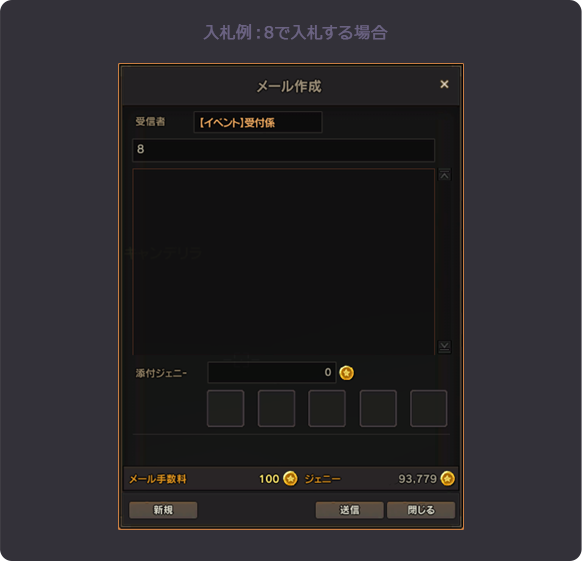 ※ There is a limit on the number of players that can enter the channel, so it’s possible some can’t go. ※ The Auction will take place using the 「Super Space-Time Radio」. Please be advised when using the Space-Time chat during the event period. ※ You can still participate in the Auction in any channel or area as long as HEMS transmission is possible. 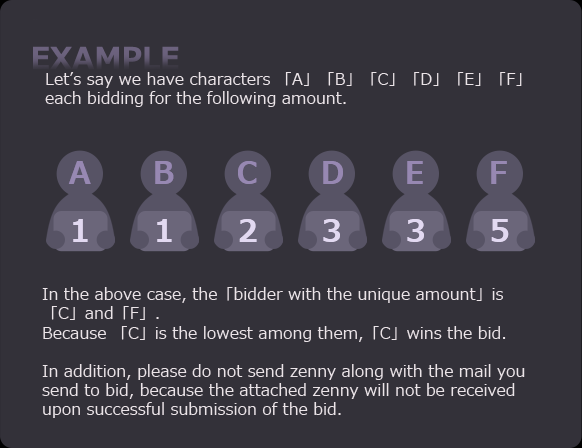 ・ Unlike regular auctions, each bidder will have the same amount of money in Reverse Auctions, and the purchase rights will be given to the bidder with lowest bid amount. ・ To participate, send your bid to 「【イベント】受付係」 with the bid amount written in the 「HEMS (Mail)」 title, using only 『Arabic numerals』. ・ You will be disqualified if you input anything besides Arabic numerals. ・ It does not matter if you use 『Full-width』 or 『Half-width』. ・ Also, 100 Zenny is required for each bid.